This is part of our 3-part series on the three most important Stoic philosophers: Marcus Aurelius, Seneca and Epictetus. Here you will find a short introduction to Seneca, suggested readings, three exercises/lessons from him as well as a selection of quotes. You can also read our introduction to Stoicism if you are not familiar with the philosophy. Author Nassim Taleb likes to tell the story of Thales of Miletus, an ancient Greek philosopher, who, as Nassim jokes, was “tired of his buddies joking that ‘those who can, do, others philosophize.’” And apparently Thales took that to heart—after some smart moves he made a vast sum of money which allowed him to confirm that his pursuit of philosophy was genuine. To show that it wasn’t a case of him denouncing wealth as ‘sour grapes’ out of inability to succeed. And Seneca was another philosopher for whom the issue of wealth and riches took central stage—how can a so-called Stoic philosopher at one point be one of the richest people in the Roman Empire? This paradox alone makes Seneca one of the most fascinating figures from antiquity and worthy of our study. But as we’ll explore below, this is only one of the many thought-provoking aspects of his life. He was born in southern Spain over 2,000 years ago and educated in Rome. He was the son of Seneca the Elder, a well-known Roman writer as well as later in his life uncle to the poet Lucan. Seneca pursued a career in politics and became a high-ranking financial clerk. During this period he also wrote tragedies as well as his Consolation to Marcia, which is part of his works on consolation. His life took a sharp turn in 41 A.D. once Claudius became the emperor as he exiled Seneca to the island of Corsica on the premises of supposed adultery with Julia Livilla, the emperor’s niece and Caligula’s sister. During his exile, he wrote a letter to his mother consoling her during his exile. Eight years later, in another twist, Agrippina, mother of future emperor Nero and wife of Claudius secured permission for Seneca to return and for him to become her son’s tutor and adviser. Nero later became one of the most notorious and tyrannical emperors in the history of the Roman Empire raising even more questions about Seneca’s character. Not surprisingly, Seneca’s wealth came largely while in service to Nero. It is fitting to mention at this point that Seneca’s death, in 65 A.D., came by the orders of Nero himself (who thought Seneca was part of a plot against him which purpose was to assassinate Nero and replace him with Gaius Piso). Throughout all those turbulent periods Stoicism remained a constant in his life. Seneca’s exposure to the philosophy came from Attalus, a Stoic philosopher who was Seneca’s early teacher. Seneca was also an admirer of Cato, whose name appears regularly in his writing. Nonetheless, Seneca didn’t confine himself only to Stoicism—he borrowed liberally from other schools, as we see him citing Epicurus in several instances. 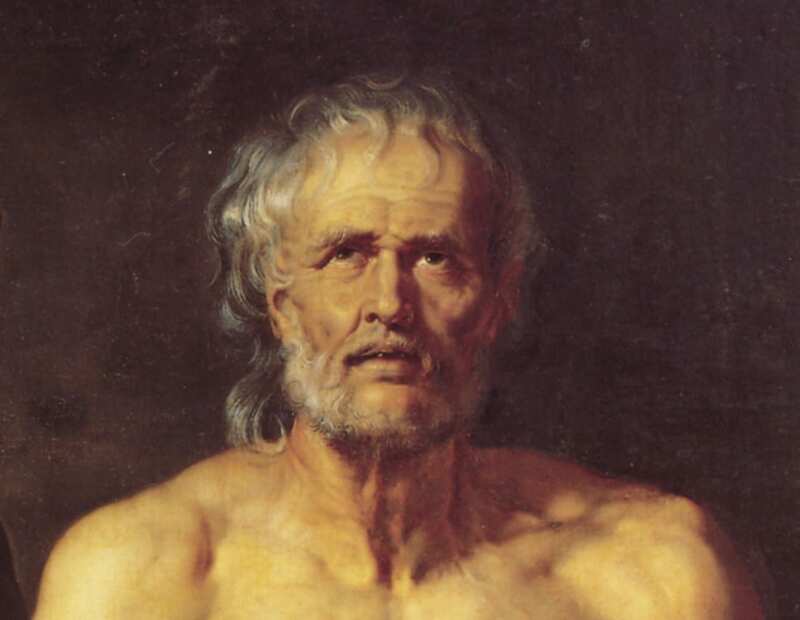 After his death Seneca was an influence on notable figures such as Erasmus, Francis Bacon, Pascal, Montaigne down to modern days as we are seeing a revived interest in him. Two notable examples amidst many include bestselling author and former trader Nassim Taleb who has dedicated an entire chapter to Seneca in his last book as well as writer and entrepreneur Tim Ferriss who published an audiobook of Seneca and has often referred to Seneca on his popular blog. And the strong interest in him is of course not surprising. Seneca not only wrote on philosophy but used it in the way it’s meant to be used: to handle and navigate through the upsides and downsides of fortune. And those he knew extremely well—varying from massive wealth to exile to handling with dignity the suicide order from his own pupil Nero. There are lessons in there for all of us, no matter what we are currently facing. He understood well enough that he was imperfect and was forced to walk incredibly difficult paths. His life was one of riches, power, ambition, politics—but also one—to the best of his extent—of philosophy, introspection and self-awareness. Letters from a Stoic From the looks of it, Seneca was a trusted friend who gave great advice to his friends. Now we can read those letters and they can guide us through problems with grief, wealth, anger, poverty, success, failure, education and so many other things. If you prefer audio books, you should instead listen to the collection “The Tao of Seneca” recently produced by Tim Ferriss. If you’re still curious, we’d recommend taking a look at Seneca’s plays, Dying Every Day, a great biography on Seneca as well as grabbing Antifragile mentioned above, which has a fascinating chapter dedicated to him. Those with scholarly inclinations might find the academic paper “Seneca on Trial” worthy if they wish to go more in depth. P.S. For more quotes from Seneca, Marcus Aurelius and Epictetus, visit our page on Stoicism quotes!